The view from the terrace. The night staff receptionist and security were great! 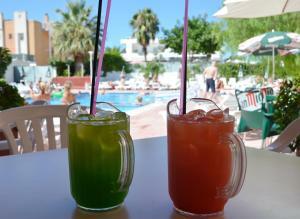 The staff make this hotel, reception morning and night, the bar staff. Second time this summer to the hotel and they honestly are so so nice. Location was great and staff were pretty friendly. Music round the pool was good. Fab place if you’re looking for something cheap, don’t expect luxury but it’s in a great location, it’s clean and the staff are friendly. El staff del hostel muy atentos, buena habitacion triple con cocina y vista al mar. Supermercados y restaurantes cerca y la parada del bus para el aeropuerto a un 100 m.
Es el más barato de la zona. Seguridad por la Noche, aunque viendo el tipo de huéspedes me parece necesario que alguien se ocupe de esto. appartement conforme aux photos. Nous avions une vue sur la baie de San Antoni, ce qui était plutôt agréable. Nous étions au dernier étage, donc pas de vis-à-vis par les voisins. La piscine est grande, avec de la bonne musique, donc l'ambiance y est sympa. La cuisine est équipée du nécessaire (poêles, casseroles, couverts, saladiers...) mais allumettes, éponges, liquide vaisselle etc ne sont pas fournis. 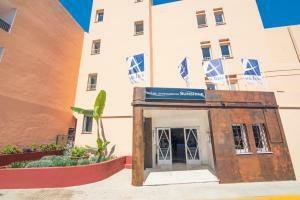 Le personnel est agréable et il est possible d'acheter les préventes des soirées en boite de nuit au comptoir de l'hôtel, c'est pratique. La literie est correcte bien que pas incroyablement confortable. Las vistas desde los apartamentos, las terrazas y la piscina. El apartamento estaba pasable, las camas eran còmodas. 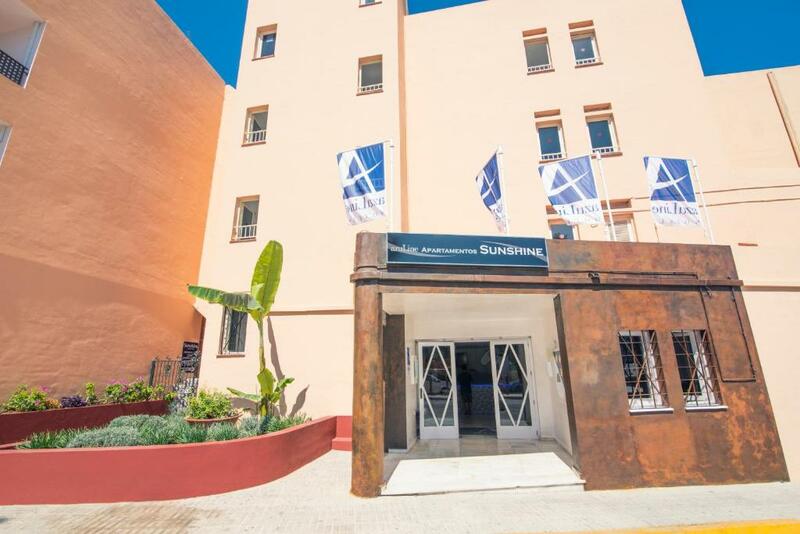 azuLine Apartamentos Sunshine This rating is a reflection of how the property compares to the industry standard when it comes to price, facilities and services available. It's based on a self-evaluation by the property. Use this rating to help choose your stay! 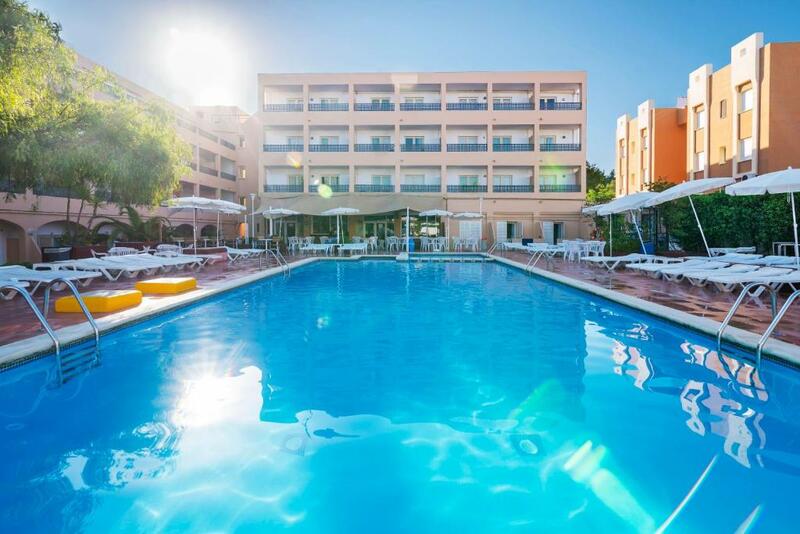 The azuLine Apartamentos Sunshine is located in Ibiza’s Cala de Bou resort, just 500 feet from the beach. 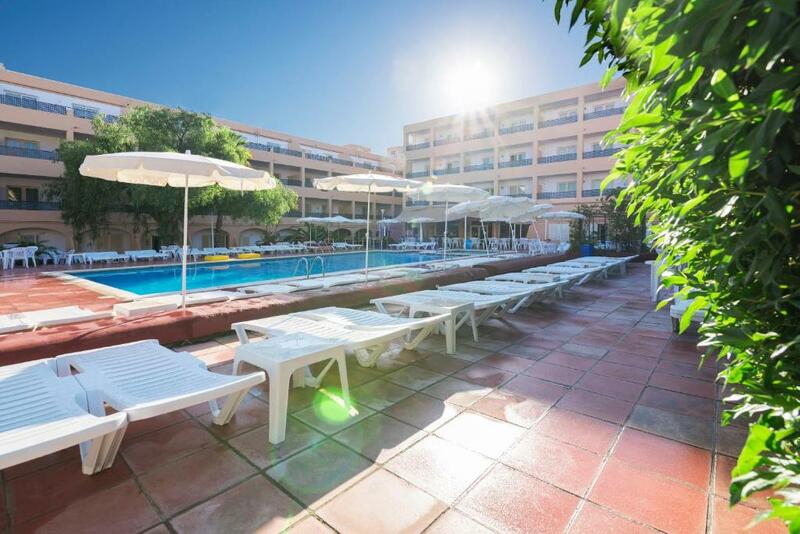 It offers a large outdoor pool and apartments with a private terrace and kitchenette. 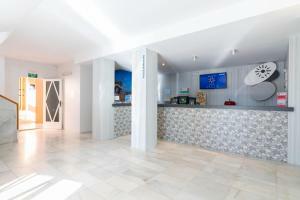 When would you like to stay at azuLine Apartamentos Sunshine? 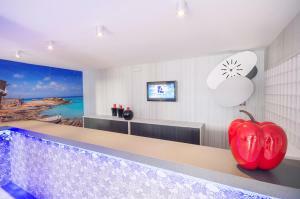 This air-conditioned studio features a private balcony with sea or pool views. It has 2 single beds and a sofa bed, a bathroom, and a kitchenette with a hob and fridge. WiFi is available at a surcharge. This air-conditioned apartment features a private balcony with sea or pool views. It has a twin bedroom, a living room with a sofa bed and an extra bed, a bathroom, and a kitchenette with a hob and fridge. WiFi is available at a surcharge. 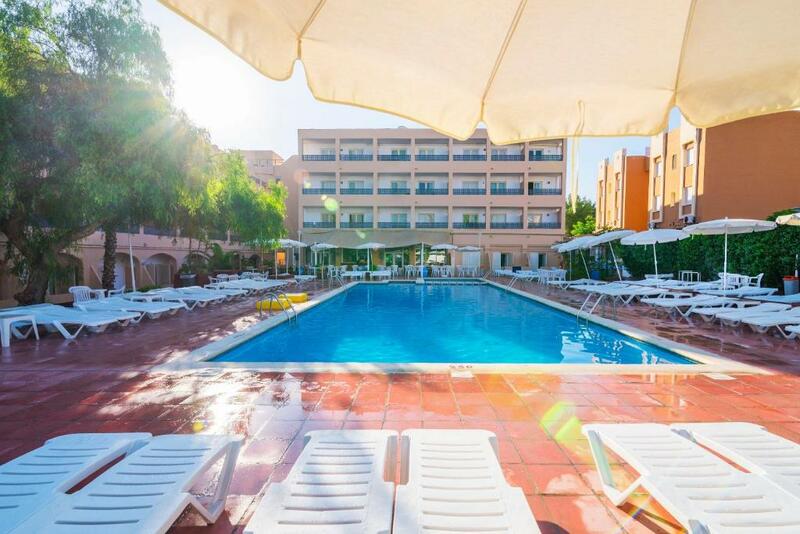 The Sunshine apartments are ideal for those looking to have fun during their holiday, in an informal atmosphere near the nightlife of San Antonio. The swimming pool is a meeting point for our guests, the perfect place for resting and enjoying the sun and long sessions of the best music of the moment. Not suitable for people travelling with children. Our hotels located in Ibiza and Mallorca offer you everything necessary for making your holiday an unforgettable experience. 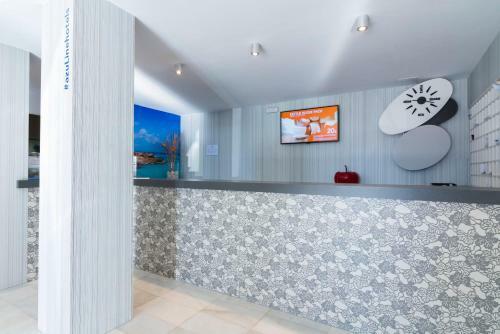 With over 20 years of experience in the tourism sector, our aim is to fulfil the expectations of our guests to the maximum, providing them with the type of accommodation best suited to their needs. We provide quality tourism at the best price, and have a team of professionals who are highly motivated in customer service. House Rules azuLine Apartamentos Sunshine takes special requests – add in the next step! azuLine Apartamentos Sunshine accepts these cards and reserves the right to temporarily hold an amount prior to arrival. Please inform azuLine Apartamentos Sunshine of your expected arrival time in advance. You can use the Special Requests box when booking, or contact the property directly using the contact details in your confirmation. The pool was nice, and rooms were spacious. This hotel if for young party people. The rooms need updating - they feel dull and depressing. I have never stayed in a hotel where when You check out they give you a bin liner to go take your rubbish out! 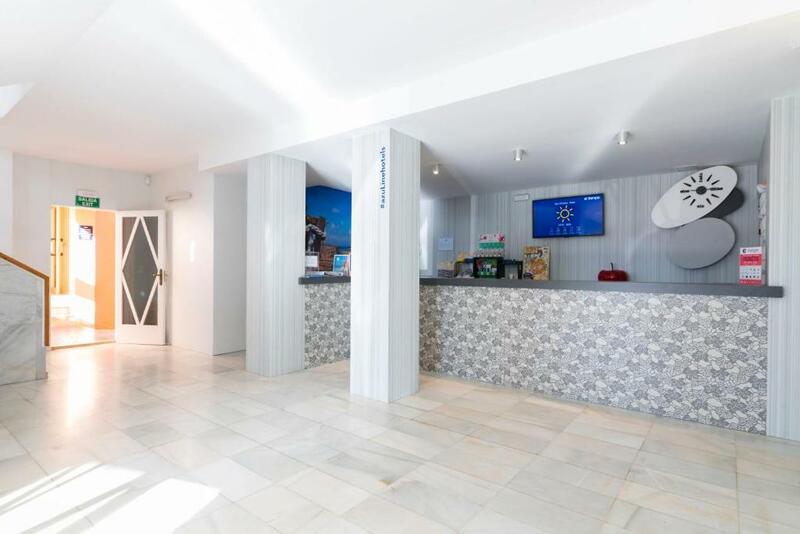 When we checked in the receptionist was rude, they asked for 100€ deposit only in cash and to walk to the cash point to get money, I declined and said cancel my reservation and to not charge me first night as I was not advised, she said oh don’t worry I wont charge you deposit and ripped paper up and said just make sure you take the rubbish when you leave. The room was very dirty, make up on walls, rubbish liquid by the bin, sweat stains on the sofa bed, floor dirty... the hob is a fire hob and they do not give you a lighter, the same receptionist said nope we sell them for 2.50€, so we had to go and buy one as nor me or my partner smoke. The halls are quite loud when people arrive home but nothing major and you can hear the cleaners with their trolleys in the morning. 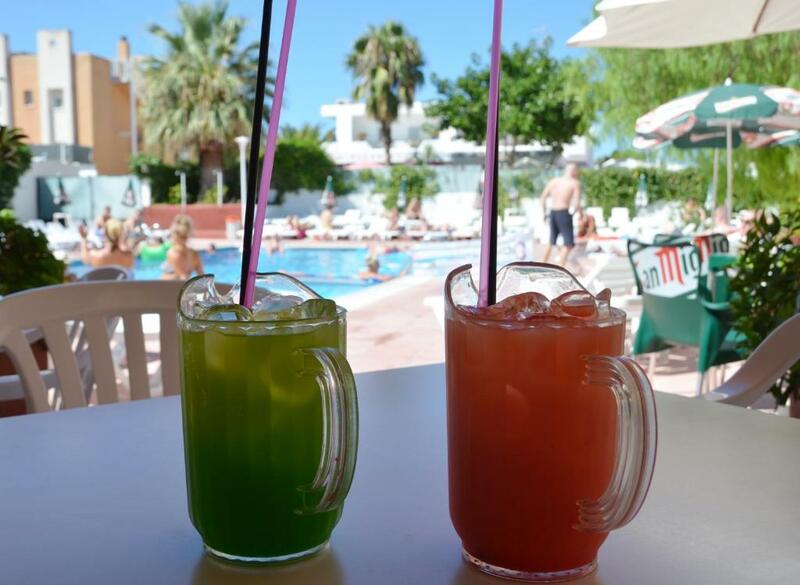 We didn’t use the bar or the pool area as we preferred to stay out but that looked all ok. There was no free internet, we booked one room for 3 person, we got 2 bed plus one damaged mattress on the floor!!!! The pilows and blankets were very old!!!! And Not really clean! We have to take our trash by ourselves! There is no shampoo in bathroom, just two small pieces of soap!!! We paid 300 euro for 2 night/3 person! With this price you can find better one, don’t waste your money fir this hotel ! If you are looking to be close to the harbour, this hotel is the opposite side of the bay.